As always, Lancaster was a wonderful show for Laga! We appreciate those of you who came to visit our booth for all of your love and support! We know this year it wasn’t easy for some of you to get here due to the snow storm that gave us 12 inches on opening day! So we really do appreciate your efforts! Bunga seemed to be a popular bag with several of our customers this year! Sharon Benz (wearing the black/grey) got support from her friend to buy her first Laga! Lori Jones snagged the only Bunga we had in black/red/cream and Linda Edwards (who has several Laga’s of her own) encouraged her friend Regina to buy the blue/cream who was truly pleased with her first Laga bag! Congratulations ladies! Lorraine Harnish from APQS has been coveting co-worker Gretchen Adams’ Harapan large handbag and decided it was high time she got one of her own! Isn’t it a beauty in burgundy/black? Great choice, Lorraine! Mothers and daughters LOVE Laga! 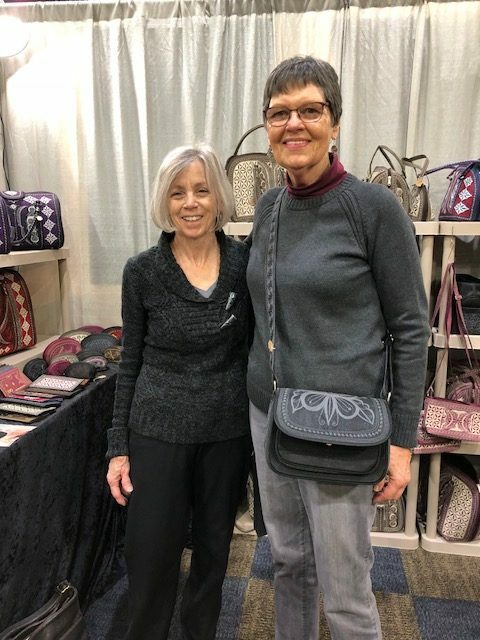 Yet another family, Elizabeth Brigham (holding her new Pagi large in black/brown) and her daughter Barbara Denys with her Harapan small in black/grey, chose Laga to be their new handbag obsession, and we are so grateful they did! And Kathleen Webb, from Studio 180 Designs, came to purchase three Laga bags to give as gifts to some very special (and lucky!) people in her life. She chose the Ria in black/cream and brown/red/cream and the Mudah in blue/cream. They are all so adorable, don’t you think? Thank you, Kathleen! PS: Please post on Facebook https://www.facebook.com/lagahandbags/ and Instagram https://www.instagram.com/lagahandbags/ about how much you love your Laga Handbags and Accessories! That’s a wonderful way of spreading the Laga Love!